Thirty-one people showed up last week for what was billed as a public hearing on the county’s plans to apply for funding to expand the Oconee County Senior Center. 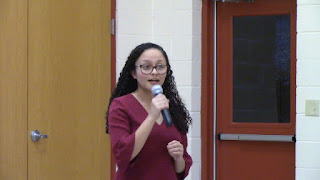 Monica Sagastizado, a consultant for the county in its bid for the federal funds for the project, said the turnout was more than she expected and that it showed a high level of support for the project in the county. The county can ask for up to $750,000 for expansion of the center, which some of those present said is inadequate for the needs of the county. The hearing was part of the process leading up to the April 1 deadline for an application for the funds. The Georgia Department of Community Affairs administers the grant program. Sagastizado, a project specialist at the Northeast Georgia Regional Commission, began the 20-minute program last Wednesday night by outlining the grant’s key requirements. Oconee County qualifies for the federal program because senior citizens are classified “by definition” as low to moderate income, she said. The hearing took place in the Senior Center itself, which is inside Oconee Veterans Park on Hog Mountain Road. Sagastizado took questions from the audience following her comments. At its meeting on Tuesday night, the Board of Commissioners approved a $3,500 contract with Carter Watkins Associates Architects of Monroe to develop a Preliminary Architectural Report for the Senior Center Expansion. County Administrator Justin Kirouac told the commissioners at their agenda-setting meeting on Jan. 29 that the architectural report will include a needs assessment and other required material for the Community Development Block Grant application. If the county receives the award, Kirouac told the commissioners, the fee then will be 6 percent of construction costs with proposed funding to be rolled into the award. The county has contracted with the Northeast Georgia Regional Commission to aid in the application process because of its experience with this type of grant application, Oconee County Commission Chair John Daniell told me as the meeting broke up on Wednesday. Cost of the service is $2,000, according to Kirouac. Oconee County is a member of the Regional Commission and paid $32,027 in dues in the Fiscal Year ending July 30, 2018, according to the group’s fiscal year report. Both Sagastizado and Oconee County Administrator Justin Kirouac told the group that the application process is very competitive. The county will learn in October if it is successful, Sagastizado said, and it can apply again in the future if it is not. Kirouac said that Howard suggested applying for the block grant, and that the Board of Commissioners endorsed the idea. “Our end game is to provide greater space for the needs of seniors in the area,” Kirouac said. Daniell said the county could include expansion of the Senior Center in a future Special Purpose Local Option Sales Tax initiative. According to Oconee County Tax records, the existing 11,356 square foot building was constructed in 2008. One of those who spoke up at the meeting said the growth of housing in the county, some of it designated for senior citizens, is going to add increased demands on the Senior Center. Sagastizado and Allison Burns, assistant director of the Senior Center, urged those present and others to provide three types of documentation to help make the case for the Senior Center expansion. The first is completion of an online survey, which is available HERE. The second is to write letters and provide them to the staff. The third is to provide photographs. “They want to see that this place really is packed and you really need an expansion,” Sagastizado said. I attended the hearing, but Penny Mills recorded the video below. Sagastizado introduced the program and answered questions. County Administration Kirouac made his comments at 6:30 in the video. Commissioner Mark Saxon joined Commission Chair Daniell at the public hearing.